We all have them in some form another - that room at the door that catches dirt, leaves, laundry detergent and dog hair. It's the mudroom, the back door, the catch-all and the laundry room. The truth is we concentrate on other, more highly-seen places and the mudroom gets a closed door and a forgotten interest. The mudroom is a much-used area of our home. It collects spill-over that doesn't fit in the kitchen. The washer and dryer are there, as are all of the cleaning supplies. It's the dogs' dining hall and their portal to the outside world. In a multi-functional room like that, it is constantly in need of cleaning and organizing. We talked about the detoxification process - getting all of the toxins and contaminants out of your home. We've talked about cleaning out closets - getting organized and clean behind closed doors. Today we're going to combine the two and take a peek in your prayer closet. 1. It's the most important decision of the day. 2. It's the most fun decision of the day. 3. It's the least important decision of the day. What we wear sends very specific messages about who we are as Christian women. Scripture is very clear about the choices we make in stocking our wardrobe. This becomes a touchy subject for some women because they don't want to give up their jeans and pants suits. They'll tell you that the Old Testament is outdated and we live under grace now. That means the law isn't necessary or applicable anymore, but God's Word is timeless, just as He is. Whether you have company stay once a year or every other week, you want that special space to be warm and inviting. Take this opportunity to create a haven for your guests - just be careful. They may want to stay indefinitely! As with any other room, it's time to take everything out of the room. Sort into your donate box and trash bag, and relocate those things that have mysteriously found their way into this room. Pull the furniture out from the wall and clean the ceiling, wall and floors. Then clean and move everything back into place and clean the center of the room. Throw the bed linens into the wash or get a great new set. Change out anything dark and heavy to something that will be bright and cheery when your company walks in. Keep clutter and knick-knacks put away so there is room for them to put their personal items out. How do you know when you're in a toxic relationship? * Do you cringe when you see their name on caller-ID? * Do you avoid contact unless absolutely necessary? * Have you stopped interacting the way you used to? * Does the conversation usually lead around to something uncomfortable? * Has it become a one-sided interaction? * Do you feel guilty when you don't write or call instead of excited that you get to write or call? This may seem extreme, but there are some people in our lives that aren't healthy relationships. They're not illicit or nasty, they're just not beneficial. A friendship or family relationship should nurture peace and growth in both participants. If they don't and it seems more like a battlefield, you need to find out why. In keeping with the cozy bedroom theme, we need to focus on that special man who share the room with us. Our relationship with our husband is the most precious one we have, next to our Savior. If the marriage doesn't stay in a constant state of detox we turn into bitter, cranky, uncontrolled women...and it's our own fault, not his! By cleaning out some of the toxins we've allowed to creep into our marriage, we can create a stronger, more lasting relationship with our husband than ever before. * Love - You may be beyond the point of puppy dog-eyes and making kissy faces, but love is still foundation of your marriage. True love isn't just a feeling that comes and goes, but the conscious decision to be kind and devoted no matter what comes along. Life isn't always flowers and candy, but it is full of opportunities to share love with your husband. What words come to mind when you think of your bedroom? During our bedroom detox process, only three words should be your focus: cozy, restful and peaceful. Our goal for our master bedroom is to be a retreat, a sanctuary. No matter what happens during the day, the bedroom is the one place you should be able to go and rejuvenate. So how do we get to that place of peace and joy? 1. Declutter. Move everything out - this includes closets and under the bed. I know this sounds like a broken record, but if you don't start with a clean slate, you'll end up in a vicious circle. Have your donate box and trash bag close, and then be ruthless. If it doesn't belong in the bedroom, doesn't serve a purpose anymore or doesn't fit...out it goes! Even the most seasoned Christian woman has "one of those days" every now and then. It may be from sickness or exhaustion or simply working too hard for too long. We've all had them and we can rest assured there are more coming down the road. Just quit for a while and you'll feel better. Why work so hard to begin with? No one will notice, or maybe not even care. When we're physically and mental weary, our fight gives out. It's a struggle just to keep the forward momentum going, let alone keep up our Christian service. And those voices don't make the effort any easier. How many closets would you estimate you have in your home? Count the ones in the bedrooms, the hallway, the bathroom, the entryway...they add up quickly. And if they're like ours, they're filled to capacity with stuff. We often think that out of sight-out of mind is a wonderful concept, simply because we can tuck the extras in our life into a closet. That lovely door shelters us from having to see everything we don't have a place for. But really all it's doing is postponing the inevitable...overflow! So look at each closet in your home like its own little room. Find a place for everything and put everything in its place. In those same few steps we've been detoxing the rest of the house, we can set each and every closet back in order. 1. Clear everything out. Empty your closet of anything and everything - take the clothes out, clear off the shelves, make sure the floor is empty and remove anything from the walls. We want a completely blank slate to work with. This is the room where your family meets in the evening for television, movies and video games. This is where you cuddle with your sweetie in front of the fireplace. This is where you fellowship with friends and family. The living room should be an inviting place that just screams, Stay here for a while! So what's keeping it from being that cozy place? Let's identify five trouble spots and how to tackle them. So at this point your kitchen is moving toward detoxification. While we're on the subject of food - we were, weren't we - this is a great time to talk about revamping your diet, too! God created out bodies for one purpose - to glorify Him! Everything that we put into these bodies is a contract with the Lord Himself. It's not just fuel and it's not just comfort. Food choices are just as important as how to dress modestly and who to fellowship with. There are no rules about what food to eat, just guidelines. They are like directional markers showing you the way. You may go off the path briefly, but your body will respond in kind. Putting the proper food and drink in will help the temple of your body run more efficiently for God. For the past two days we've walked through a kitchen detox behind closed doors - cabinet doors, refrigerator door and pantry doors. In this final step we'll cover the aesthetics and all the surface detox to make your kitchen both safe and pretty. * Clear everything off the counters and walls. Set up a small table to hold all of it, or put it in another room temporarily. * Wash all towels, dishcloths and window treatments. They just gather dust and oils from your cooking. * Start at the ceiling and work your way down. Use your vacuum cleaner attachment to remove all cobwebs and dust from the corners and walls. If there are areas of wallpaper or paint that need touch-ups, take care of them now. * Wash the windows and window sills. Open them up and get rid of all the outside grime that may have come in through the screen. I pray that you're in the midst of a kitchen overhaul! Yesterday began the detox of the kitchen cabinets, which is a huge undertaking. Don't be surprised if that part alone takes several days. When you need a break from sorting and organizing behind those doors, move on to your food stash. Focus on the refrigerator first. Empty it and check all of the expiration dates on the packaging - some of it is probably past its prime. Set the good stuff aside for the moment. Remove the shelves and drawers and wash everything in hot, soapy water. Your owner's manual may have specifics about what types of cleaners to use or not use. If you don't have it anymore, use some gentle dish soap and a soft cloth. Then sit back and enjoy that "new refrigerator smell" again. Second only to the bathroom, the kitchen is an important place to detox...over and over again. Think about all the things you're putting into your body and the bodies of your family and you'll soon realize how cleanliness and order are essential where you eat and prepare food. So much of our day is spent preparing meals, unloading groceries and washing dishes. All of that use will create messes, germs and disorder in a hurry. The kitchen is a large, full room so we'll break the detox process down into manageable steps and spread it over a few days. Nothing says you have to hurry through your cleaning and organizing, so take as many days (or weeks) for each step as you have time. 1. Wipe down the counters. Don't worry about a deep clean because we're going to use them in the next step and get them grimy again. Just clear them off and clean off the major messes. Have you noticed how many magazine covers and television shows scream: A New Year, A New YOU? Apparently January 1 brings about this magically time when we can change everything and start brand new. According to the Scriptures, when I accepted Jesus Christ as my personal Lord and Savior, I became a new creature. God has already moved past those old things and made me new through Him. Why would we want to be somebody new? Better, perhaps. More grounded in the Lord and His word, yes. But something new and different? God has made me new so I won't have to try to become new on my own. We're all snug in our homes during these cold winter months. Even here in the south we're bundled in front of the fire for a warm evening indoors. But being tucked inside a closed-up house for weeks at a time has its effect on your home's air. Contaminants build up and air toxins can cause serious health issues. If someone in your home already has asthma or allergies, they will intensify without an air detoxification. Go through your home looking for some of the major culprits of bad indoor air. * Make sure all of the gas appliances are properly installed and vented correctly. This will prevent gas fumes from seeping out into the home. * Pet hair and dander can fill the air, affecting even those who don't suffer from allergies. Groom and bathe pets as recommended by the vet, keeping fur under control. Also clean furniture, rugs, carpet and hard surfaces frequently. If you've even done a fraction of the detoxing we've been talking about over the last few days, chances are that you've had both good thoughts and bad thoughts about the process. The mind is incredibly powerful for both motivation and destruction, depending on how you allow it to work. We've all had those depressing days when that voice in our head tells us that everything is bad, we'll never get anything accomplished so why try. When we don't turn off our minds to those lousy thoughts, our mood plummets, our productivity takes a dive and we'd rather curl up with a pint of Rocky Road than work around the house. An important part of our life detox process is filtering out our mind. The thought process we use to be good servants and good stewards for the Lord is essential. This is my least favorite topic ever, so we're going to get it out of the way early in this process. The bathroom isn't a difficult room to tackle, or the largest one by any means, but one that requires cleanliness and diligence. Begin your bathroom detox by clearing everything out of the room - start with empty counters, empty cabinets and no shower curtain. "Stuff" will just get in your way. We'll sort and clean it all at the end of the day. Next you'll want to spray a leave-on cleaner in your shower. 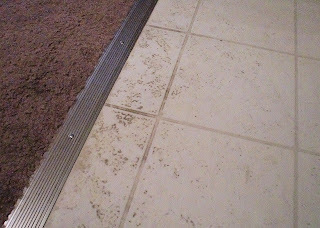 Use one that is a deep-cleaner and one that is specific for whatever tile product you have. (No, they're not all the same.) Let the cleaner sit and do its work while you go on to the next step. Set a timer if it requires a certain length of time to really work. Remember that the product should be doing all the hard work, not you. What collections do you have in your home? Do you love books? Pottery? Bears? Flowers? Butterflies? Cats? Roosters? Glassware? Everyone has things they love and enjoy placing in (large) groups around their house. But what do you do when your collections take over your living space? It might seem like there are books spilling out of the bookshelves and piling up in every room. 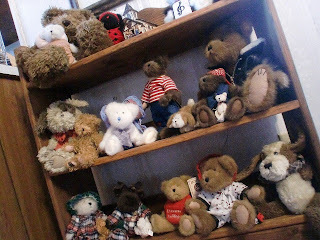 Or maybe you have more stuffed animals than people! Perhaps you can't close your kitchen cabinets because you've collected so many different baking pans. The idea with any collection is a combination of enjoyment and moderation. There is nothing wrong with surrounding yourself and your family with the things you love. That's one of the joys of having your own space. But as with anything in life, moderation makes your collection manageable and fun. As we go through our homes and detox each room, we're going to find tons of paper. Bills, receipts, letters, coupons, lists...there are so many things we keep and let pile up. Soon those piles overrun everything and that's all you see in each room! Room by room, we need to collect all of our paper in one place. Having a designated home for each and every sheet of paper that comes into our house is essential or we'll waste time and energy looking for things when we need them. Here's a brand-new week in front of us. All of these blank, beautiful days God has blessed us with are just begging to be filled with chores and activities and worship. There are so many ways we can spend the time we've been given, and the start of the week always holds so many opportunities. So how will you decide how to prioritize all of those chores and activities and worship? When you run out of time at the end of the day, will you be pleased with what you chose to do? How are you to make wise decisions about your priorities? Our church family has been burdened with death over the past few months. Some of our sweet senior saints have gone on to be with the Lord and others are imminent. Even as the wife of an embalmer, death is never easy. There are so many mixed emotions that accompany the passing of a loved one. We want to rejoice because they are now face to face with Jesus Christ Himself. There is disappointment and longing over the separation. And we question our own life and how long it will be before the Lord calls us home, too. But regardless of age or health, there is comfort for the soul of a Christian woman. What images come to mind when you think of a dining room? Is it a peaceful place for a candlelight dinner? Or a festive atmosphere where the whole family is gathered? Or perhaps that special occasion location has become overrun with clutter and you couldn't eat at that table if you wanted to! When we don't use spaces for what their original intention was, they don't seem to feel right. We have a huge, high dining room table that takes up most of the room. When that table is piled high with papers and computers and the contents of my purse, the rest of the room could be spotless and it would still feel oppressive. I'll admit that we don't eat at the table all that often. We use it more for working on our computers in the same room or as a collection place for things leaving the house. The unfortunate problem is that it's also the collection point for things coming in, and if they don't make it past that table, that's where they often stay. The most simple and most profound way to bring toxins into your home is on your shoes. The results are grimy linoleum, stained carpets and damaged hardwood flooring. Cleaning up those well-traveled areas will not only change the look and feel of your home, but will give you confidence and motivation to continue your detox process. Pictured here is our entryway floor. It's that textured laminate tile stuff that always seems like a bear to keep clean. It's right inside the front door so everything from outside gets tracked onto it. The girls use it as a thoroughfare to every room in the house, so it's a trap for dog hair. That's why it looks as though we have a family of 27 instead of just four. We often think of floor cleaning as running a mop over the hard surfaces and chasing the vacuum around the carpets. That might do for a quick pick-me-up, but it's not doing much to detox your floors. If you're truly serious about ridding your home and your life of all the junk you've allowed in, it's going to take some time. Yesterday we talked about clearing out the entryway of your home - this is not a project you can tackle in a day and be done with it. It requires time and attention to truly detox a space. Even if we were to spend hours in each room and days examining our lives, we would still just scratch the surface of the grime we've built up. Each layer that we clean off or sort out is a powerful, positive step toward being the victorious Christian woman that God designed us to be. But how do you find time in your lovely, busy schedule to take care of home, family, work, cleaning, chores, errands and all the rest of the requirements packed into each day? The answer is: by detoxing your schedule! As we begin the physical detoxification of our homes today, we're going think about the first thing that people see when they walk into your house. Whether you have an actual hallway like we do, or your door opens directly into a room, that entry area leaves a lasting impression on everyone who comes through the door. So what is it that people are going to see in your entryway? The idea here is to create a welcoming space that draws people into the rest of the home. 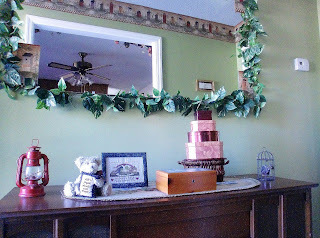 Keeping this area clean and de-cluttered invites your loved ones from that first visual. I did my prayer walk through our home yesterday, and I pray you did, too. Getting some perspective on the situation changes everything about how you plan your attack on the contaminants in your house and life. What that prayer walk also did was bring one thought to mind: Can I just get a new house and start over? 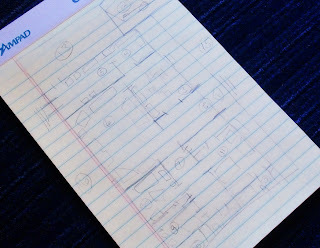 As I wrote down all the projects I wanted to tackle and messy areas I wanted to clean, I ended up breaking the house up into 16 separate areas. I included each room, the garage, car and front and back yards. Each one got a page and they filled up quickly, but it was rather inspiring to see how much potential our home has. And then came my second thought...can I afford to hire someone who will do all of this for me? Those 16 pages suddenly became a daunting challenge that might be better left to someone else, right? Starting today we begin the process of detoxing our lives - home, body, attitude, mind - the whole kit and caboodle. This is a huge undertaking, but with prayer and planning we can rid ourselves of the contaminants we've allowed in. Before we start cleaning, sorting or throwing out anything, we need to find God's perfect will for our lives. Do a prayer walk through your house, asking the Lord in each room what He sees as problems. Pray that each area of your home be used in ways that will glorify and honor Him. What is it in each room that is keeping you from serving Him better or in new and exciting ways. Carry a notebook with you and jot down what the Holy Spirit reveals to you. You may discover that layers of dirt and dust are creating health problems, making you less effective as God's servant. Or maybe clutter has made your bookkeeping and finances less than efficient, so you can't use the blessings He has given you to their fullest. Can you think of one thing God has done to bless you since you woke up this morning? Can you remember a blessing from yesterday? Can you remember blessings from the past week or month? The further back we go in our memory, the more blurry those great and mighty things God has done become. How do you jog your memory about other things in your life? Do you write yourself notes to read later? Do you mark something on your calendar or type it into your computer or phone? Do you use sticky notes or tack a reminder on the refrigerator? Perhaps you've found some system that helps you remember those important details you will need in the future. But have you ever built an altar? Now that the holidays are over, life will return to normal. But what does "normal" mean? Looking around our house this week, I would have guessed a bomb went off. With everything else going on, I haven't taken much time to set the house in order. My suspicion is that yours probably looks very similar. As I was starting my chore list for the clean-up effort, it suddenly became clear that there was more than just a straightening needed. Little things pushed to the back burner have now become bigger things. Tasks that I had planned on doing the first of the year are now ready to be done and new ones have popped up to join them. The list is growing because my home needs tended to.